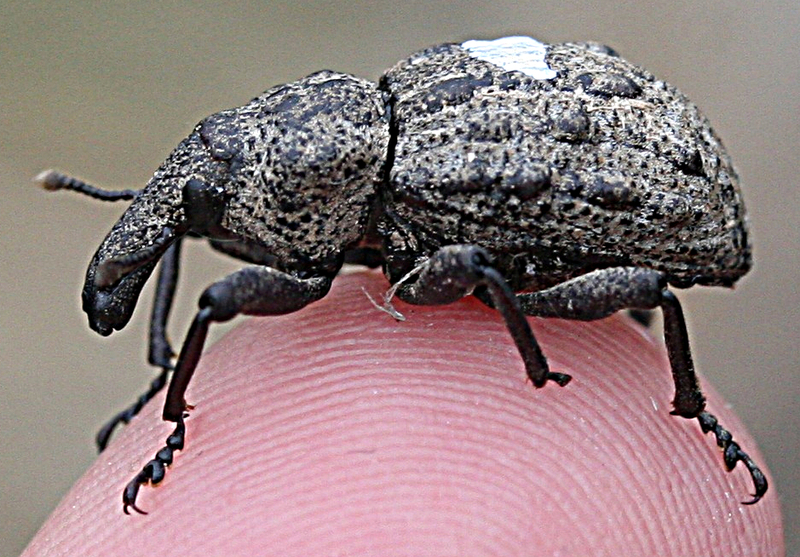 Radio New Zealand National’s critter of the week was the Canterbury knobbled weevil (Hadramphus tuberculatus), described by Nicola Toki as the “stegosaurus of the insect world”. This small but rather adorable looking weevil was once widespread across the Canterbury Plains of New Zealand, but thought to be extinct since its last sighting in 1922. 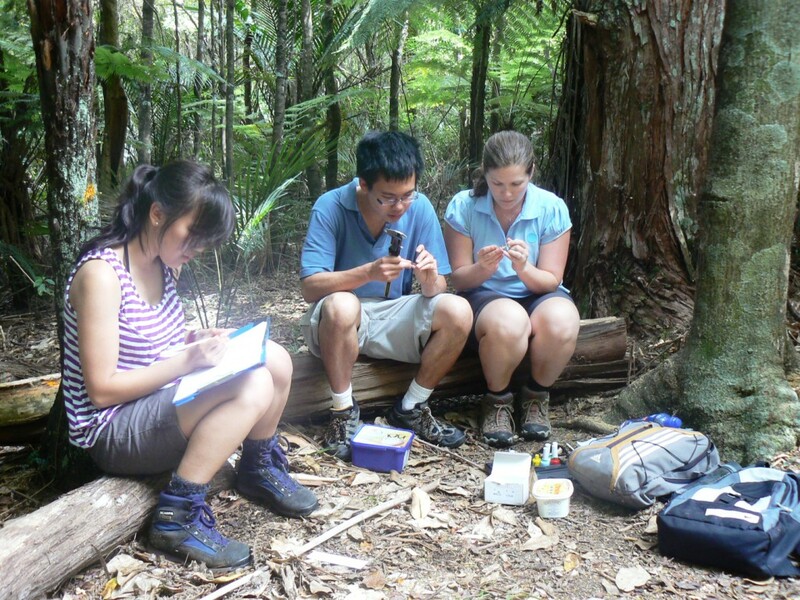 Incredibly, in 2004 Laura Young, a graduate student at the University of Canterbury at the time, rediscovered a population of the weevil among the speargrass she was studying in Burke’s Pass. Like so many species, this charismatic little insect is likely to have been doubly impacted by introduced mammalian predators, as well as a huge loss of habitat as the Plains were transformed into pasture. Despite further surveys completed since the weevil’s rediscovery, no other populations have been found and this species remains listed as critically endangered. A PhD study done on the weevil by Emily Fountain at Lincoln University estimated the population to be 138 individuals in 2009, declining to 76 in 2011. As Nicola alludes to in the radio interview, insects and other invertebrates unfortunately receive a lot less love and attention from the public than the megafauna such as birds and whales that we perceive to be more charismatic. I wrote a little bit about this in an article for the Maungatautari Ecological Island Trust in 2014 so I thought I would repost it here. We live in an invertebrate’s world. The famous entomologist E O Wilson observed that when you walk through a tropical rainforest over 90% of the animal body mass around you is made up of invertebrates, and yet we are more likely to notice the birds than the bees. New Zealand is also well-endowed with spineless creatures – insects alone are estimated to number more than 20,000 species compared to 170 bird species*. Our insects have an extremely high rate of endemism (over 90%), meaning they are found nowhere else in the world, and many have bizarre life-history strategies such as flightlessness. Invertebrates play a key role in the healthy functioning of our ecosystems, but when we pause to admire our natural surroundings we rarely give these animals a second thought. Invertebrates include over 95% of all known species worldwide, so it should be no surprise that we would be in trouble without them. These smaller creatures are responsible for bringing a large proportion of the food we rely upon to our tables through pollination, and play an integral role in the decomposition of organic matter such as leaf litter to promote forest health. Invertebrates are also an important food source for many of our favourite birds and native fish. Although we can appreciate the importance of invertebrates, the huge gap in our knowledge of most species explains in part why they remain a low priority for conservation. Their mind-boggling diversity alone acts as a roadblock because it is hard to know where to begin with setting priorities and developing management plans. Invertebrates are, however, susceptible to the same pressures that our flagship bird species are under, such as habitat loss, introduced species and pollutants, and they are declining at a rapid rate. The recent publicity about honey bee colony collapse disorder affecting much of North America and Europe is testament to this point, and perhaps serves as a very serious wake-up call about why we should care about insects. For all their challenges, there are opportunities for invertebrate conservation that are in many ways more achievable than efforts to conserve a bird or mammal. Many insect species, for example, only require a small area of habitat to sustain a population, and captive breeding can often be done effectively in a laboratory for much less cost than a vertebrate. New Zealand already has several examples of this, such as 81 hectares of inland sand dunes put aside to conserve the unique habitat of the Cromwell chafer beetle (Prodontria lewisi), and 200 hectares of gorse scrub fenced off to protect a remnant population of Mahoenui giant wētā (Deinacrida mahoenui). 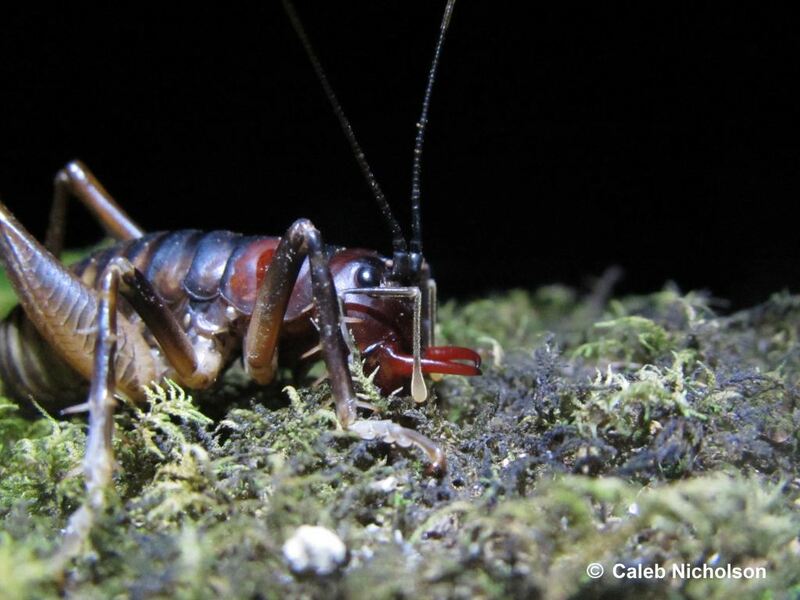 Several wētā species are the target of captive breeding programmes, such as the wētā punga (D. heteracantha), which has recently been translocated to Motuora Island from Auckland Zoo. 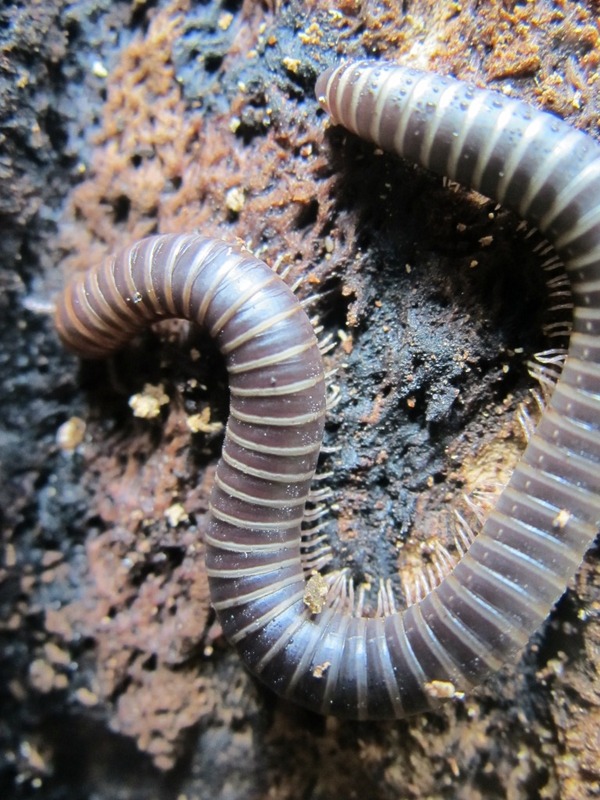 As a behavioural ecologist, invertebrates are a source of scientific wonder for me, and the fact that they are severely understudied means the opportunities for research are endless. 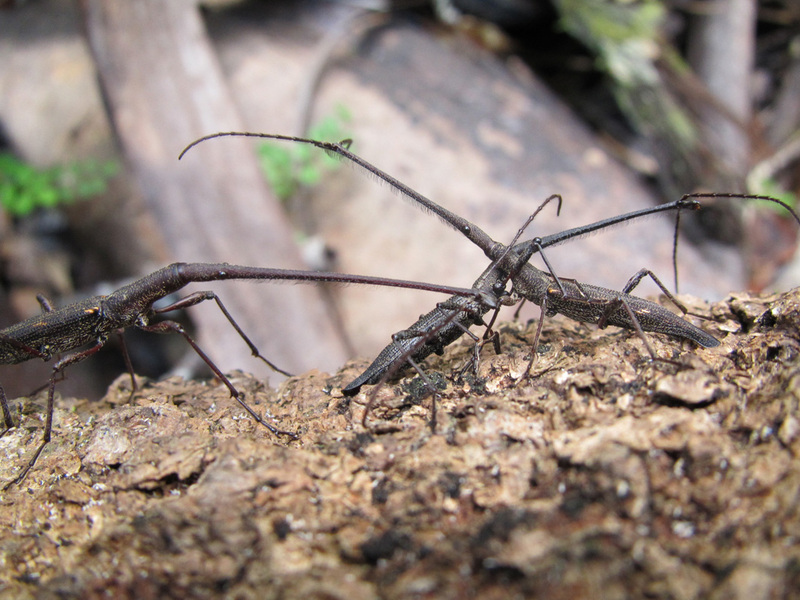 When I began my PhD on the New Zealand giraffe weevil (Lasiorhynchus barbicornis) I was astonished to discover that almost nothing was known about this species, despite being one of our larger endemic insects, and in my opinion one of the most charismatic. Despite providing fantastic opportunities to learn more about our natural world, this situation is common the world over, and is surprising given the relative ease of working on invertebrates in comparison to birds and mammals. Adult giraffe weevils are attracted to sick or recently fallen trees, where they aggregate in sometimes very large numbers** to copulate and lay their eggs. The larval stage of a giraffe weevil takes place within wood, where they tunnel around possibly feeding on fungus. It is this larval stage of giraffe weevil biology that has the most important effect on forest ecosystems by aiding in the decomposition of dying or fallen trees. My research, however, focused on adult behaviour, particularly trying to figure out why male giraffe males have such a hugely elongated rostrum (extension of the head). While females use their rostrum to drill holes in trees in which they lay their eggs, males use their rostrum as a weapon, and in some battles like a jousting-pole, where they fight between themselves to secure the best female. The quirky behaviour doesn’t stop there though. If you watch an aggregation of these creatures carefully enough, you might spot a couple of very small males hiding underneath a mating pair or trying to squeeze themselves in between a large male and his female. This sneaking behaviour seems to have allowed small males to gain just as many mating opportunities as their larger foes. My ongoing research aims to continue to peel away the layers of this fascinating story, while also delving into the world of some of our other invertebrate species in an attempt to do my small part to increase our understanding of the smaller but no less wonderful species that co-inhabit this earth. *The number of native New Zealand birds varies depending on the source you use, but suffice to say there are a lot less bird species than insects! Check out the fantastic New Zealand birds online for more information. ** Using coloured paint combinations to accurately identify individuals, I once counted over 100 adult giraffe weevils aggregated on a single tree in one day at my field site in West Auckland. Although thought to be an uncommon species, my field work around NZ showed that this species is actually a lot more widespread and far less rare than previously thought.